The introduction of the N-series Ford tractors and their high sales numbers created a huge market for add-on accessories for the tractors. Many companies started making products to “improve” the Ford’s usefulness or make their operators more comfortable. But one stood out just by the sheer number of “goodies” they sold and that was Sherman Products. The Sherman brothers were insiders with Henry Ford and Ford’s dealers would sell and service many of the Sherman’s products. Front endloaders and backhoe attachments were popular. Some items such as the aluminum head and the live pto didn’t go over as well. 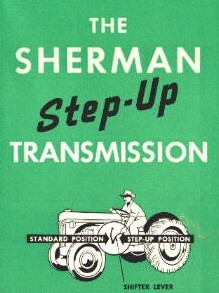 Far and away the Shermans’ most popular add-on was the auxiliary transmission. 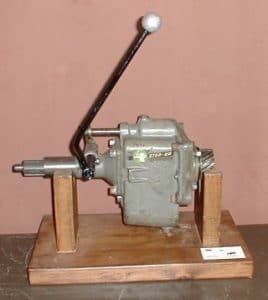 By the introduction of the 8N, tractor buyers could order a Sherman transmission when they ordered their new tractor and Ford would ship the tractor with the Sherman attached to it. The dealer mechanics then installed the transmission before delivery. Their first offering was the Step-up transmission which gave the owner twice the gear selection he had before. Step-up first and step-up second gear was between the regular second and third gears. It was basically an overdrive unit for the transmission input.